Georgian Profile Cornice: Providers of DIY Wainscot Systems. 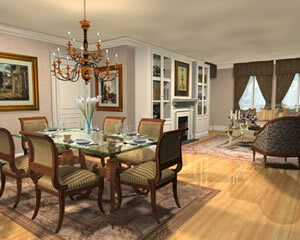 Includes moldings, trim, ceiling ornaments, beadboard paneling, chair rails and baseboard. Simple, yet elegant, this profile is well suited for either 8 or 9 foot ceiling heights. This family of profiles is available in two sizes and can be easily mixed and matched throughout your project.